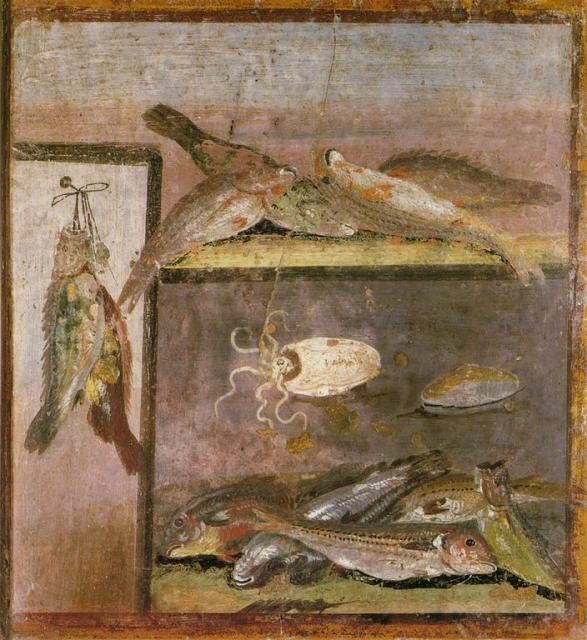 Still Life with Squid, a fresco from Pompeii (it actually looks more like a cuttlefish to me). Oh, boy, summer and grilled calamari. My Nassau County childhood. Nothing better. I love the way the tentacles curl up when they hit the grill and become alive. Really freaky. 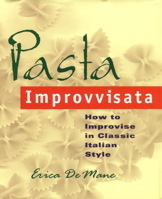 Have a salad or a bowl of dressed pasta waiting, throw your squid on the fire for a quick one two, and add them to your bowl. 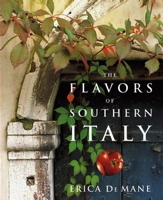 The grill juices will mix with your tomatoes, pesto, or vinaigrette to produce a lovely sauce. With this creation I cooked up a bit of barley and mixed it with seared cherry tomatoes that I finished with a hot vinaigrette made from the tomato pan juices, rosemary, garlic, and splashes of both balsamic vinegar and red vermouth. I added the grilled calamari and a handful of chicory at the last minute. If I make this again I think I’ll use frisée instead, since it’s a little more tender. I grill these creatures when I can find extremely fresh, small ones. If you only see large calamari at your market, try a slow-simmered approach such as this braised, stuffed squid I did for an Easter menu last year. Place the barley in a saucepan, and cover it with water by about 4 inches. Season with salt, and bring it to a boil. Adjust the heat so the barley simmers at a low bubble, uncovered, and cook until just tender, about 30 to 35 minutes, adding a little hot water if the level gets too low. Drain it well, and pour it into a large, shallow serving bowl. 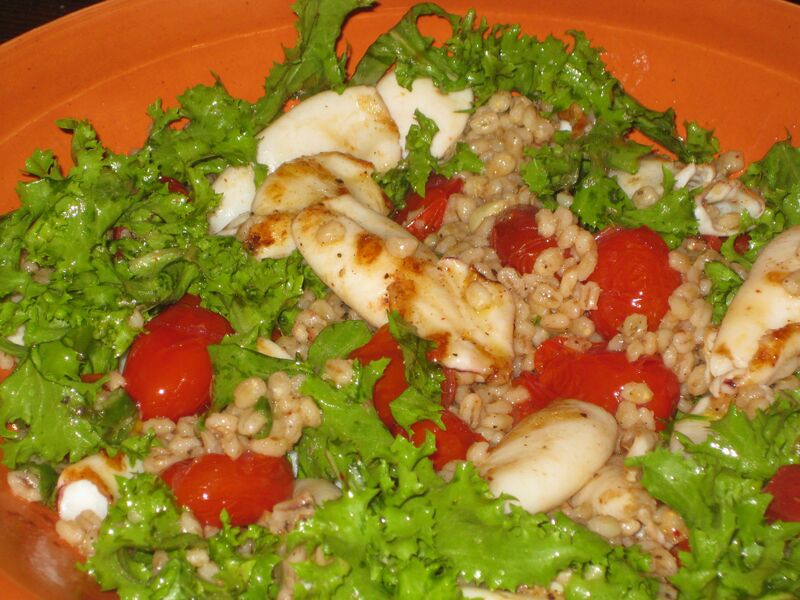 Give the barley a generous drizzle of olive oil, and toss. In a large sauté pan, heat about 3 tablespoons of olive oil over medium-high heat. When hot, add the tomatoes, the rosemary, and the garlic, and sear until the tomatoes start to burst, about 4 minutes or so. Season with salt and black pepper. Add the balsamic vinegar and the sweet vermouth, and let them bubble for about 30 seconds. Turn off the heat. Add the tomatoes with all the pan juices to the barley. Dry the calamari well, and toss it with a little olive oil, salt, and black pepper. Coat the jalapeño with a little oil as well. Set up a stovetop grill plate over high heat (or an outdoor grill with a steady, settled down flame). Place the calamari and the chili on the grill, and cook until grill marks appear, about a minute or so (make sure not to crowd the grill, so everything can grill properly). Give everything a turn, and grill the other side, about a minute longer. Add the calamari to the barley. Mince the jalapeño, and add it, along with the chicory or the frisée, to the bowl. Give everything a gentle toss. Correct the seasoning. Serve right away.